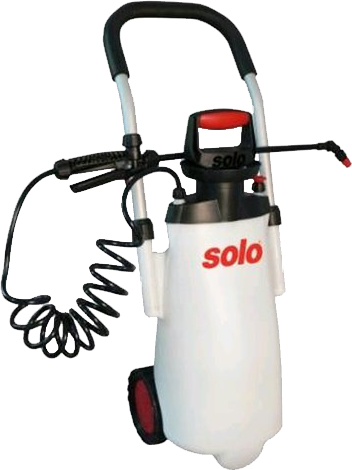 Plant maintenance made easy: The large wheels of the Solo 453 trolley sprayer make it easy to pull along, facilitating work involving long distances, whether moving through a garden or transporting to site. Yet the use of aluminium for the height-adjustable handle keeps the weight right down. The dry weight is a mere 3,5 kg. Just a few pump strokes are enough to build the necessary pressure inside the 11 l tank. The pump handle is large and robust enough to be securely gripped with gloves. The same applies to the tank handle with its soft grip sleeve. A spiral hose provides the necessary reach. Universal spray wand made from special, durable plastic. Made from ultra-light carbon fibre for fatigue-free work in greater spray ranges, total weight only 60 g.
Made from ultra-light carbon fibre for fatigue-free work in greater spray ranges, total weight only 75 g.
Universal application by adjusting the spray wand length. Prevents dripping after shutting off the manual valve. Consequently meets all relevant regulations. Convenient treatment of double rows and large areas. Up to 180° flexibility for individual plant protection and cleaning work. For spray pressure control. Precision application of spray medium with the required pressure. Extremely light for carrying on the front or back with backpack sprayers. 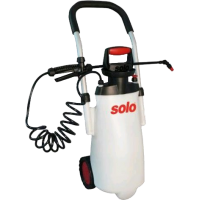 May be used with all Solo spray wands for manual sprayers. Two swivelling nozzles for simultaneous spraying of two rows of plants. Versatile nozzle use. Comprising 8 nozzles. Universal application. Manual valve for professional use with pressure gauge connection, child-proof lock and continuous use. To protect adjacent plantations. Prevents small droplets from drifting, limits the spray range. Important for weed control in the immediate vicinity of plantations and ponds. For apply medium in restricted areas, e.g. for fertilising or combating weeds. Adjusts from fine mist to long jet, e.g. enables pin-point accurate application over a greater distance. For increased reach, e.g. for espaliered trees, high shrubs, etc. Recommended for use with spray boom or drift guard near the ground. Recommended for use with spray boom. Made from ultra-light carbon fibre for fatigue-free work in greater spray ranges, total weight only 120 g.